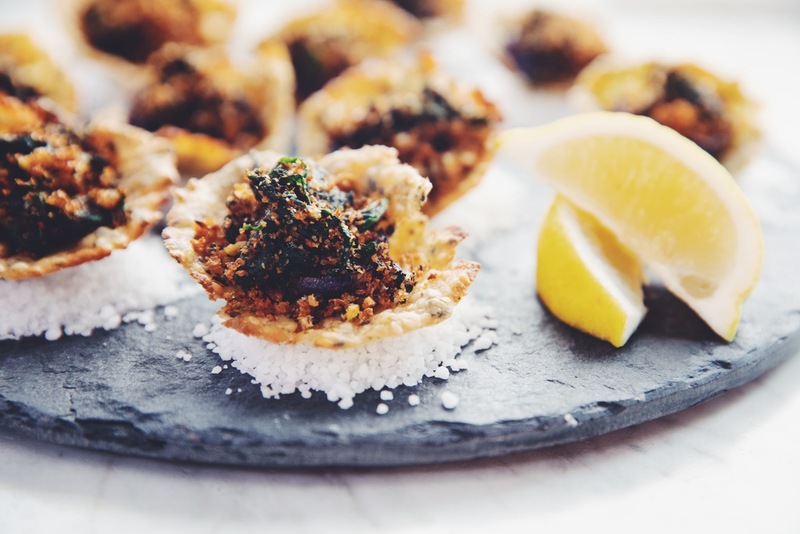 I bet you never thought you could create a vegan oyster?! Well, here’s the hot for food rendition of oysters rockefeller, complete with an edible shell and everything! The first time I had vegan oysters was at Crossroads in Los Angeles. Chef Tal Ronnen serves his in a steamed artichoke leaf. It’s cute, but not as easy to eat. And truthfully, I can’t find artichokes out here in Toronto in the dead of winter. So I made this flavorful, sesame cracker-like homemade shell that you’re going to love. I decided to try glazing eggplant with miso paste for the oysters, and kept the rockefeller part of this whole recipe pretty authentic. The nori is what provides that seafood flavor, but it’s definitely not over powering. Check out how to make this recipe in the video below and if you’re looking for the vegan calamari that’s right here. 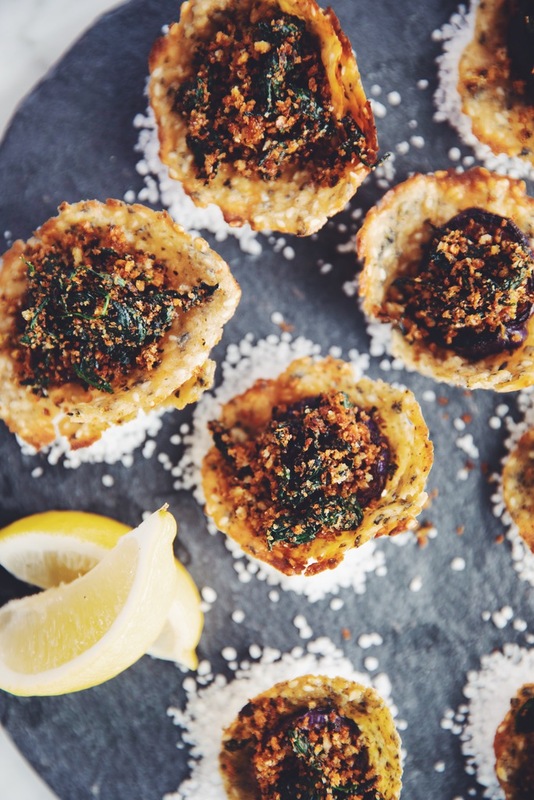 This vegan oysters recipe is basically magic! I hope you give it a try at your next fancy party. To make the vegan oyster shells, preheat oven to 350°F. Break up the 10 nori seaweed snacks used for the topping and the shells, into small pieces. Place them into a coffee/spice grinder and grind until they're a fine crumb. Dump out into a small bowl and set aside. In a medium bowl, whisk the aquafaba for 2 minutes until foamy. Add sugar, sesame seeds, garlic powder, 1 tbsp of the ground nori, and soy sauce/tamari. Whisk together, while adding in the 2 tablespoons of melted butter. Fold in flour using a rubber spatula. Stir in 1 tablespoon of water at a time until the batter looks smooth. The batter shouldn’t be too thick and should slightly pull away from the sides of the bowl. Keep more water on hand in case the batter thickens up. Use a teaspoon to spoon 1 heaping teaspoon of batter onto a small parchment lined baking sheet. Use the back of the teaspoon to smooth out the batter and form a circle that is about 2 1/2-inches wide. Bake in batches of 3, because the shells will cool and harden quickly once out of the oven. Bake for 7 to 8 minutes until the edges are golden brown. Have a muffin tin on hand when take the shells out of the oven. This is for the oyster shells to cool and mold into a cup-like shape. As the shells cool slightly on the baking sheet, cut a small 3/4-inch slit from the outer edge towards the center of the shell. Use a small offset spatula to lift the shell from the baking sheet. Then using your hands (carefully, as it will still be hot), fold and slightly overlap one side of the slit over the other to form a curved oyster shell. Press this gently inside of a muffin cup tin to cool and set. Between baking batches of oyster shells, place the muffin tray in the fridge to cool quickly between batches. To make the garlic crumb topping, sauté spinach in a small non-stick pan on low to medium heat without oil, for about 2 minutes. Remove the spinach into a dish and set aside. In the same pan add vegan butter and spread it around as it melts. Then add garlic, panko, 1 1 /2 tablespoons of the ground nori, lemon zest, sea salt, and chili flakes. Toast this mixture for about 6 to 8 minutes until golden brown, stirring occasionally to prevent burning. Add the sautéed spinach back in and mix well to combine. Remove it from the hot pan into a separate bowl, and set aside. To make the miso-glazed vegan oysters, in a small bowl, whisk together warm water and white miso paste until smooth. Add 6 to 8 eggplant rounds and toss in the sauce to coat well. Heat a large non-stick pan over low to medium heat to melt 1 tablespoon of vegan butter. Swirl it around to evenly coat the bottom of the pan. Place eggplant rounds in the hot butter and fry for 2 to 3 minutes on each side until brown and caramelized. Set aside. For plating, you can place small piles of coarse rock salt for each oyster onto a serving dish. Place a miso-glazed eggplant into the shell, and top with a generous amount of the spinach garlic crumb topping. Place oysters on top of each pile of salt. Serve immediately. Chinese eggplants are longer and thinner than regular eggplants. Look for eggplants that are approximately 1-inch in diameter. All the components of the recipe can easily be doubled if you want to make more for a larger party. Hello there! I took your advice and made these for Valentine’s Day! Let me tell you, they are divine. My husband, non-vegan, said he was impressed and wanted to know how I made them taste like oysters. Magic! I love your cookbook and make recipes from it regularly. I enjoy your creativity and it inspires me to get in the kitchen and get cooking.